Korean-Canadian violinist, Angela Ryu, 19, began her musical studies at the age of five with Daphne Hughes in New Denver, BC. In 2009, Ms. Ryu moved to Calgary, AB to further pursue her violin studies at the Mount Royal Conservatory. She was a full scholarship student of the Advanced Performance Program under William van der Sloot. Ms. Ryu has won several national competitions including First Prize at the Canadian Music Competition, and the Grand Award at the National Music Festival. 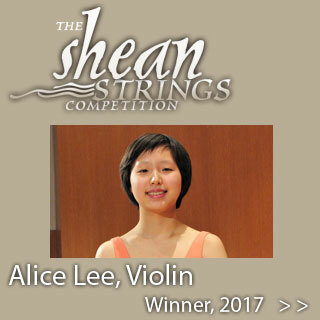 She was also a semi-finalist of the 2016 OSM Manulife Competition and the 2018 Klein International Strings Competition. Ms. Ryu has soloed with the Calgary Civic Symphony and Calgary Philharmonic Orchestra, making her orchestral début at age 13. She held her début recital in the High River concert series: “Young Musicians Extraordinaire” and has an upcoming engagement with them in the 2018/2019 season. Ms. Ryu has performed for renowned artists such as James Ehnes, Pinchas Zuckerman, Mauricio Fuks, Midori, and Mihaela Martin. She has also participated in summer festivals such as Morningside Music Bridge, the Orford Music Academy, the Meadowmount School of Music, and the NAC Young Artists Program. This summer, she will be attending the Aspen Music Festival with a violin fellowship. An active musician in her community, Ms. Ryu was a violin teacher of the Calgary Multicultural Orchestra, providing free lessons and instruments to children from low-income families. Ms. Ryu is currently pursuing her first year of her Bachelor of Music degree, under Paul Kantor at Rice University, The Shepherd School of Music.